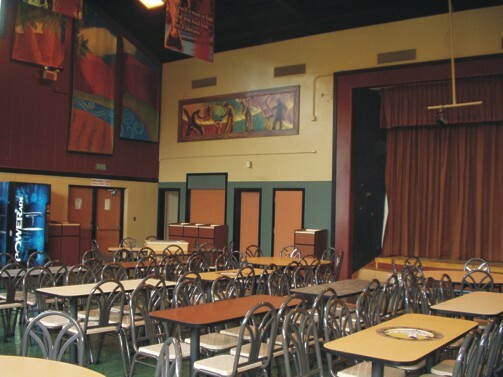 Artwork on banners and walls depicting Native American themes. Enclosed trash receptacles like McDonalds™ - no more ugly open containers. Pedestal tables with school logos can be easily rearranged for use by student groups. 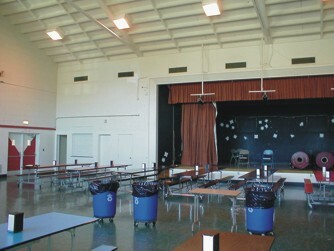 Before: This place looks like a gymnasium with blah white walls and a very high ceiling. After: With a paint design provided by our artists, the room is more attractive. Native American Tribal themed artwork reflects student design ideas.